Storage reels and pipe reels supplied by Reelco International Inc.
At Reelco International Inc. we specialize in providing durable and reliable pipe reels and storage reels that have been produced, manufactured and customized by our in-house professionals. Our production techniques are catered to meet both customer expectations and environmental standards. For hundreds of years, the technology behind storage reels and pipe reels has been evolving to meet companies' needs and provide an ideal aid to storing cables, ropes, hoses, cords, and more. Our reels are made from light but durable materials to ensure maximum efficiency. If you are looking for conduit reels, collapsible reels, or other reel technologies, you have come to the right place. We ensure that all of our reels meet customer demands while remaining environmentally friendly. This personal commitment to our product guarantees reliable, high-quality performance and client satisfaction. 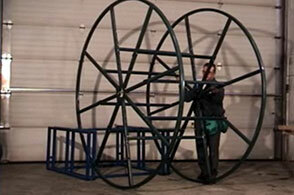 For more information on storage reels, pipe reels and more, please contact us. Reel Assembly as easy as 1,2,3. Take a look at how we create our Reels within 3 minutes. A great video demonstrating our process.